You've worked hard on your lawn and garden throughout the season and you want wildlife to flourish all around you, but regular visits from deer can negatively impact your landscaping efforts. There are several indicators of deer damage that can help determine if you are receiving these unwanted visits. Deer prints are the first sign that a deer has been in your garden or lawn. They will appear as two tear-drop indentations next to each other, measuring between two and three inches in length. A few prints should not be cause for concern, but with an increased volume of tracks comes a greater chance of significant damage to landscaping due to grazing. Deer droppings are an unsightly warning sign of a high deer population, but make for easy monitoring of favorite grazing spots. Deer pellets, unlike the round rabbit pellets, are elliptical in shape. If you are worried about deer on your property, you should make note of this common mistake so that you aren't blaming the wrong animal! The pellets tend to scatter when deposited unless fruits and berries are introduced into their diet. If you have small fruits and berries in your garden, you should expect some light snacking to occur. During the winter, deer will eat bark, swigs, or just about any thriving plant for sustenance. If you notice the trees and shrubs surrounding your yard being slowly stripped of their bark and leaves at about waist height, you've more than likely had some deer stop by for dinner. The resulting damage will be tattered in appearance due to the deer’s lack of front teeth. So what can you do to prevent deer damage? The first and most effective method of preventing an unwanted deer population from encroaching on your property is to avoid planting things that deer enjoy eating. In the winter months, they are not very picky about what they eat, but you can abstain from planting their favorites. Among those are cedar, yew, fruit trees, lilies, hostas, tomatoes, and cabbage. If you can, move the smaller of these into enclosed spaces. 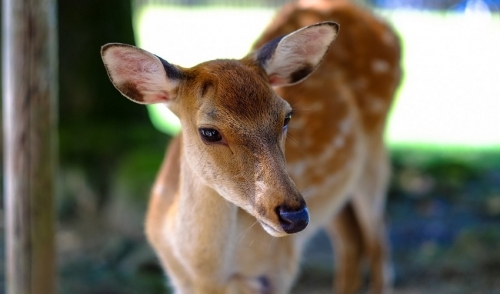 Deer dislike plants with thorns and fuzzy or leathery leaves. Other methods of deer repellant include manually frightening them away with a sudden, loud noise. However, deer develop grazing patterns and may become accustomed to the noise, rendering this method ineffectual. Building a physical barrier is an effective choice, however, since deer can jump very high, a fence of seven feet or higher is recommended. The most mild and effective way to keep deer away is to gently repel them with unfavorable odors and tastes. Rotten eggs and garlic seem to be two of the most effective repellants available and they are an easy do-it-yourself solution for keeping deer away and keeping your lawn and garden looking crisp and manicured.